prudentinvestor Market cap only RM108 million but net cash more than RM155 million and available for sale investment worth over RM20 million. No logic. noah Profit increase 8645% yoy !!! truthseeker516 what's the reason that revenue no change much but profit increase so much ? noah does not make sense at all why the management did not privatize this company. net cash alone exceeds the market cap. if you want a net-net company, this is the one. but the boss have history of ripping minorities off like KBUNAI and PTGTIN. prudentinvestor Long forgotten jewel. Hope someone will discover it one day. prudentinvestor Apart from making 5.3 million or 6.32 sen a share from business operations, the value of its available for sale investments also increased by 6.8 million or 8 sen a share and its NTA increased by 11 sen.
prudentinvestor Its available for sale investment, namely 339 million KBunai shares is worth another RM23.73 million or 28 sen a share. stockraider Paperlane brother....potential privatization mah...!! prudentinvestor Highest in more than two and a half years. Further rises expected. Have been in the doldrums for far too long. taitaumau Based on my observation, this big smart boy has been patiently accumulating this counter since early march. prudentinvestor Don't really know what kind of tricks he has up his sleeve. Since Facbind is so much undervalued, the most logical thing to do is to use some of its spare cash to buy its own shares in the open market.. Only around 55 million shares are in the hands of small shareholders and shareholders who are not associated with the Directors. Just RM 71.5 million, or less than half of its total cash reserve is sufficient to buy up all these shares at RM 1.30.The company directors aren't working for the interest of the company. Fabien Extraordinaire this is a typical example of value trap as management does nothing to create value and there's lack of price catalyst. hidden value in this company is for everyone to see...its net cash per share is 40% more than the share price. Kinz Same situation for 4 year d . Price from 1.4+ to 0.90 and to today price . Company profit also gain from FD interest only . prudentinvestor Just a quarter way through a slow and long climb to its deserved position. prudentinvestor Highest closing price in more than three years. Rosy days probably lie ahead. prudentinvestor Slowly creeping up over the past several months without being noticed by small investors. Privatization probably in the pipeline. taitaumau Will this big boy make closing price 2 bids down? shareinvestor88 Another similar company is FLB flushed with cash 123m. No debt. prudentinvestor Facbind has RM163 million cash or 191 sen per share. It has available for sale investments (more than 300 million Karambunai shares) worth another RM20 million. Angel of KLSE 大马股仙 why nobody talking this counter recently? The edge recommend buy, you know or not? not interested in this counter? investor1458 How high can fly ? prudentinvestor Facbind's cash has gone up to RM 167 million in its latest quarterly report. 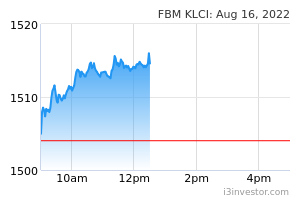 At 8 sen a share, its 339 million Karambunai shares are worth another RM 27.1 million. Cash + shares are already worth RM 2.28 per share. prudentinvestor If the company directors do not know what to do with it's over RM 150 million cash pile, just distribute the money to the minority shareholders as dividend and let them decide what to do with their money. cherry88 Based on latest financial data as at 30Sep, its CASH per share stood at RM1.77 ! If you include their quoted shares and bond (total RM38.8mil), its CASH and CASH EQUIVALENT per share goes to RM2.30 !! This company has no borrowings. they are doing the "Dreamland" mattress. Most of you may buy this product before. Subject to privatization, and possible at RM2.30 (against its Net Asset of RM2.57 per share). At current price of RM1.20, you are buying at RM1.20 in exchange to cash in the company for RM2.30.